Welcome! This Blog, by the author of brotherswar.com, contains a collection of articles and opinions relating to the more human side of the Battle of Gettysburg and the American Civil War. This has become a passion of mine, one that I hope you too will enjoy. It's been a while since I've posted here. I've decided to begin again but at a site directly affiliated with my web site brotherswar.com. If you'd like to have a look, please feel free to join me at brotherswar.com/CivilWarBookmarks. A few people have been kind enough to ask that I leave this blog on-line for future reference. I will do so. After some time passes, perhaps I will yet begin again. Writers worldwide eagerly herald the creation of about 175,000 new blogs each passing day. With these new literary births, a smaller number simultaneously fades less dramatically into oblivion. As recent readers know, I have been considering adding this blog to the count of the latter. After much though, I have made my decision and I now mournfully and reluctantly set down my pen. I reached my decision this week after much consideration of the responses to the blog articles that I have written these past few months. As I tended more to address the darker side of war, enthusiasm for my writings diminished. While I never sought to obtain an unfettered adulation from those visiting here, my concern increased over the lack of reader receptivity to the less "Currier and Ives" portrayals of our shared past. I also remain troubled that I may have inadvertently contributed to an overly romanticized image of perhaps one of the most tragic kinds of endeavors in human history. As I pondered my choices over the last several weeks, the words of Nathan Bedford Forrest rang progressively louder in my ears. "War means fighting," he proclaimed, "and fighting means killing." Consistent with a change in the tone of the comments I have recently received, one example may serve to encapsulate them all. The very fine web site, Civil War Interactive, has over the last few months chosen to ignore many of my posts in their weekly reviews. I had grown accustomed to the lack of a response to my writings on the previously proposed casino at Gettysburg but grew troubled by the disregard shown for what I consider my darker posts. Instead of acknowledging any specific disapproval and despite the presence of new articles most weekends, they instead implied that I had ceased to write. I have come to believe that avoiding the discussion of the more savage aspects of war damages the perception of both the degree of our ancestors’ incredible sacrifices and of the importance of the lessons we take from their excruciating ordeals. The continued lack of enthusiasm for the discussion of the brutal, raw side of war contributes to my concerns that avoiding such issues increases the likelihood that those who have not experienced combat may conclude that war is more glorious than is justified. Given that between 170,000,000 and 216,000,000 people have died during the wars of the 20th Century, the highest total in thousands of years of civilized human history, I can no longer satisfy my conscience while writing what may contribute to a sterilized, romanticized view of warfare. Questions broaching which soldier could have constructed a more efficient offensive or defensive strategy too often resemble the casual discussion of a football game rather than addressing how to avoid the massively tragic slaughter altogether. Certainly I could continue to write regardless of the response and push ahead with discussing the horrors of war. At this point though, I have neither the energy nor the desire to continue with that struggle. I need only look inward for the source of this apparent shortcoming and, in acknowledging as much, I must accept responsibility for the portion of the diminished enthusiasm that originates from within. Once I have had the time to develop a greater understanding of the origins, justifications, and costs of warfare and the degree to which my small corner of the cyber world influences individual opinions, I may again take my pen and breathe life back into the pages of this blog. For now, I maintain my continued unwavering respect for the veterans of all of America’s conflicts and wholeheartedly thank everyone who has stopped here to read and reflect. This writer acknowledges the right of the web authors noted above to conduct their web sites as they so chose. I intend no implied criticism by my interpretation of their actions. Last weekend I posted a message saying that I wished to take some time to think about the direction of this blog. For those who have been kind enough to visit here over the past few years, I feel that I owe you an explanation. In a post some time ago, I mentioned that I came to my interest in the American Civil War in an entirely serendipitous manner. I stumbled upon Michael Shaara’s Pulitzer Prize winning masterpiece, "Killer Angels", and was so moved that I immediately drove to Gettysburg to see the place where such deeds had occurred. Standing for the first time on Cemetery Ridge, I gazed across the mile wide open fields where Southern men advanced into the awaiting frenzied maelstrom of Union rifle and artillery fire. I could not fathom the courage such an act required and set about trying to comprehend. For the better part of the last decade, I have walked the fields where our ancestors fought and marveled at the hardships they endured to forge the country we now call home. I began to think that perhaps I understood some of what occurred. I wrote blog articles implying as much, expressed opinions, and created a large web site with over 600 pages of photographs and information. I read constantly. The American Civil War became my obsession. Yet, despite all of my work, another chance event has made me question whether or not I have approached any real understanding at all. Several weeks ago, I began to read more about later wars in American History, looking for evidence for or against the uniqueness of the internal conflict which had captured my fascination. Settling on World War II, I began to read about the primary events, the causes, and the staggering numbers of casualties. Despite some knowledge of the second Great War and the number of American casualties, I was stunned to read the estimates of 60 million people or more killed during WWII, with civilians making up more than half of those numbers. As I continued to read, my focus on the primary battles naturally led to June 6, 1944 and February 19, 1945. On the morning of latter date, the United States forces set foot on the black sandy beaches of the island of Iwo Jima, a Japanese stronghold coveted by the Allies as a necessary staging area for their continued counter-offensive. The battle lasted over a month, much longer than expected, and resulted in slaughter on a horrific scale. Of the 22,000 Japanese who sought to defend their ground, almost all were killed. The Americans suffered about 26,000 casualties of which over 6,000 died. Similarly, on June 6, 1944, the Allies launched their assaults on the beaches of Normandy. Serving as the beginning of the Battle of Normandy, the Allies would suffer about 10,000 casualties with some 2,500 dead on that fateful day. Estimates of German casualties on D-Day, although not verifiable, fall between 4,000 and 9,000 men. These very familiar battles carved gut-wrenching suffering and pain into the hearts of thousands of families, into the psyche of those who braved the machine gun and artillery fire, and into the wounded soul of humanity worldwide. And yet, the human wreckage at Gettysburg paralleled and by some measures eclipsed these battles. Again, to anyone who has even a passing knowledge of our history, the casualty figures ring all too familiar. I am not a veteran and have never seen combat. I realize that what I have read, what I have seen, and what I may imagine, cannot begin to approach true comprehension of the horror of battle. I cannot place myself in the boots of the American Servicemen who tenaciously fought a faceless, hidden enemy at Iwo Jima, one willing to die where he fought. I cannot fathom the staggering degree of courage required to surge forward on Omaha Beach in the face of such terrifying, horrific losses. Although I cannot conceive of what these men endured, I have written for years about the great battles of the American Civil War, Gettysburg, Antietam, Chancellorsville, and Fredericksburg among them. In each of these battles, men were torn apart by canister, shot, and shell. Minnie balls shattered bodies leaving the less fortunate to writhe in agony on the unforgiving ground. In some instances, soldiers died via the bayonet, rifle butts, rocks, or anything else which served to assault or defend. At Gettysburg, in just three days, ten thousand men died. Thirty thousand men emerged no longer whole. Another ten thousand were officially designated as missing. 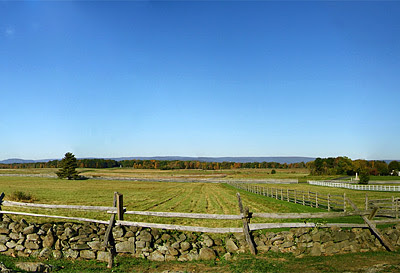 By some estimates, the killing at Gettysburg reached such a level of devastation that about as many mules and horses were killed at Gettysburg as Allies and Germans combined on D-Day. As mentioned in a recent post, the 20th century saw about 200,000,000 people killed by war, a greater number than at any other time in human history. While I unquestionably admire the bravery of the United States servicemen and veterans, while I remain ever grateful for their contributions to the world that we now know, and while I will forever honor their memory, my questions are simple. I wonder about my responsibility for the impact on the children of today of what I write. I wonder about my responsibility to the men and women who are dying right now in yet another human war. By writing in a manner which to some degree glorifies and romanticizes the exploits which occurred during warfare, do I add my small voice to the chorus of those who may view war as acceptable or even desirable? If the answer is yes, do I then, even in a small way, contribute to the acceptance of the continuation of this human holocaust? I cannot help but wonder if by writing with such admiration and wonder about the soldiers of the American Civil War, I perpetuate the idea that war is somehow an acceptable mechanism to resolve conflict. At times, to fight is necessary. But should it ever be acceptable? Perhaps I flatter myself. Perhaps what I write is ultimately irrelevant. And yet I fear that even in a small sense, I may contribute to an unnecessarily romantic image of what is one of the most brutal and unforgiving of human endeavors. As the fires of each previous war flicker out, the echoes also fade of the countless wishes that this war will finally be the last. Perhaps, just this once, I should listen to the long, stilled hopes that our ancestors had for this country. In "Killer Angels", Michael Shaara implies that we have within us a divine spark coexisting with something much darker. What I must decide is, have I perhaps inadvertently fed the latter. I'm going to take a short break from blogging. I need some time to consider the direction this blog will be taking. Thank you and hope to be back soon. I recently received an e-mail from a gracious reader. She mentioned that she had recently visited Evergreen Cemetery in New Haven, Connecticut. While touring the cemetery, a re-enactor mentioned that several of the Civil War veterans were buried standing upright as if at attention. An e-mail to the cemetery elicited a denial that this was the case. However, my question is whether or not this practice ever existed. Research on my part only revealed the occasional practice of vertical burials to save space. My second question involves a piece of information I heard several years ago during one of my first tours of the Battlefield at Gettysburg. The guide mentioned while we toured Oak Ridge that there had once been an airstrip in the fields just south of Oak Hill. Since that time, I have not found any information concerning a runway at Gettysburg. Of course, the battlefield had once been the site of Camp Colt, a US Army tank training camp during World War I but I have not heard of an airstrip associated with that camp. One point of interest. 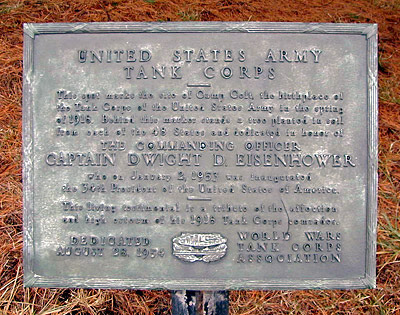 The single pine tree (above) along the Emmitsburg Road just west of the Angle at Gettysburg was planted by the soldiers of Camp Colt in honor of their Captain, Dwight D. Eisenhower. They planted the tree with soil from each of the then 48 states. I would very much appreciate any clarification or information concerning either of the above. I love our history. It is who we were and at times what we may become again. To ignore history is to choose not to fully understand ourselves and to sacrifice what our world could yet be. Were We The Good Guys?